Developing Your Competitive Intelligence Skills is an introduction to competitive intelligence, which includes the definition of competitive intelligence, and 5 flavors of competitive intelligence: tactical, strategic, technical, counterintelligence and benchmarking. It also illustrates some analytic tools like SWOT, STEEP, BCG share of market matrix, and Adrian Slywotsky’s radar screen. 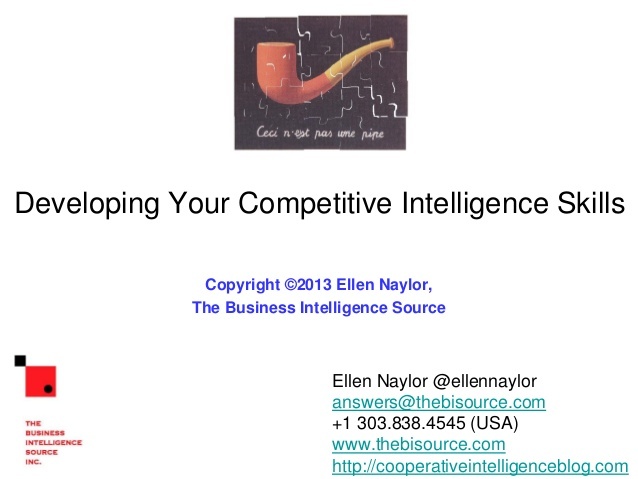 This is a good introductory presentation for those who are new to competitive intelligence.